Cross-reference by Nudd – Back in the Saddle! It’s been a couple of years since I wrote a blog for a puzzle, but, seemingly a lifetime after the inception of LWO, I find myself back where I started. So, what have we got? Standard looking 12×12 grid. 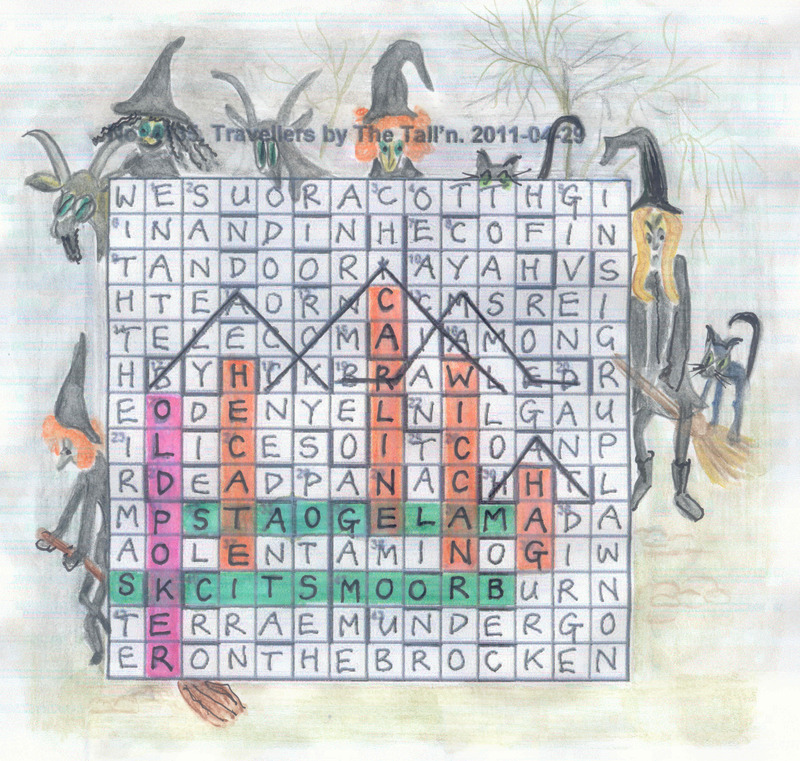 Fourteen double clues, and a thematic creation to highlight. Looks okay – no carte blanche, no really horrible gimmick, cup of tea by my side, some music on the stereo (the newly reborn Big Country), the family are quiet (save for Peanuts the new(ish) family hamster scuttling around on the floor), so off we go! 17ac looks like a goods starting point – Miler jogging on earth bearing more trees. Obviously an anagram of MILER + e for earth. RELIME? No, ELMIER looks more positive. We’re off. The way forward here must be to work out the double clues – presumably these are going to be some of the longer ones. 9ac looks like one of these, as ‘shaped, some said til-shaped’ looks like an anagram if ever I saw one. TIL = SESAME, so…. (ponders for a minute) – SESAMOID. And the first part of the clue looks like a play on RECENTLY/DECENTLY, so we have DECENTLY and SESAMOID. But which to enter? Let’s look at some of the crossing answers. 2dn must be REGALE (GAL in REE – there’s only one type of ‘enclosure’ or ‘yard’ in Scotland) so we can be fairly certain that… well, of nothing, it appears, as the second letter is E in both DECENTLY and SESAMOID. Grrr. Oh, the CD’s finished. Time to change over. More Big Country live, I think – they’ve just toured with Mike Peters from the Alarm replacing the sadly deceased Stuart Adamson on vocals, and I was lucky enough to see them in Leeds a few weeks ago. If anybody wants to see a REALLY good live band, then go along next time they tour. Wonderful stuff. Anyway, back to the puzzle. 15ac looks like it could be something-ROTTEN (or ROTTE). With the crossing A, we get ?A?ROTTE – GARROTTE? Can it be spelt with two R’s? A quick check in Chambers, and it can. Good stuff. The intesecting 5dn is a nice clue – ‘Not quite slow – fast’, which is LENT(O). So, even less helpfully, 9ac now looks like ?E????E?. Great. Maybe we’ll concentrate on another area of the grid. Half an hour later, and more progress. Have managed to identify BEDRID at 3dn, what might be ADAGES at 1dn, and that means that 9ac now looks like DE?EA?E?. So It looks as if perhaps this might be entered as DECEA?E?, which could be DECEASES – a real word, which is good, and half of each word joining in the middle. I wonder if this holds throughout? 37ac looks like ESCAPIST/ETALAGES, so following this logic, this would be entered as ESCALATE, also a real word. That can’t be coincidence surely? Hmm, the word ‘cross’ in the title seems to now have meaning as well, as the resulting words are ‘crosses’ of the original clued answers. Also, it is possible, judging by the misprints that I have already found, that the end of the misprints spell ANIMAL. That is also promising…. Quick break to talk to Molly (now 8 – fans of the early LWO site and its predecessors may remember her as being much younger. We’ve just had a good laugh (or at least I have). Molly was looking through my wallet and found my conservative party membership card, and asked me how I joined the conservative party. I said it was just like joining the Beano Club (of which she’s a member, if now not so enthusiastically as she once was). She looked astonished at that, and asked ‘What, does that mean that David Cameron is like Dennis the Menace?’. 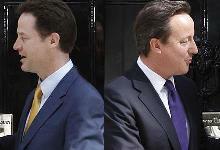 I said ‘Yes, and Nick Clegg is like Walter Softie’. She didn’t understand, but it was good to have finally established the de facto pairing that Dave and Nick resemble – Dennis the Menace and Walter. I think there are many Lib Dem voters who might agree on that one! With that degree of political insight, maybe Molly might be the new Paxman when she grows up…. Anyway, back to the puzzle. 14dn is NEMN, but I’m not at all sure about clueing n = NOON = MID-DAY. I think some people might moan about that. It’s only a small gripe, however. I’m remarkably puzzled by the start of the message spelt by misprints. I have H?O? ?ING ANIMAL – what is that all about? Is there an owl with a speech impediment around? Actually I’ve been stupid – I already know GAR = FISH from GARROTTED, so that’s actually H?OF?ING animal. What on earth? HOOF SING ANIMAL? I Really don’t understand. I’m also getting annoyed by 35dn, (crab injured crow (4)), which I’m guessing involves anagramming one of CRAB or CROW, with a misprint somewhere. Actually, that’s probably BRAG. I’m still not happy with the ‘A operator B’ type clue though, as discussed in the guidelines for setters. Maybe I am getting grump…. Ah! I have it. Nestling on a bookshelf to my right is a set of old green hardback books, all a bit stained and the worse for wear. And there, on the spine of each of them is HUGH LOFTING. Of course, H LOFTING ANIMAL, which is the PUSHMI-PULLYU, which was the front halfs of two animals (a unicorn and a….. can’t remember the other one) put together. And there, in the SE to NW diagonal, I can see most of PUSHMI-PULLYU. Job done! Well done to Nudd on a) a theme that I like and know, and b) a good treatment of it. Just a few clues to finish off, and then we’re done. And we’re not even up as far as the Big Country encores yet. Hurrah! Ten minutes later, and the grid is complete. I enjoyed that, as I said above. Do I have any moans? Well, probably the two small clueing ones I mentioned above. I’m also a bit surprised at the fully checked entries – it would have been easy to have proper unching in two of them by adding a bar to turn USAGE into SAGE, and in the symmetrically opposite entry, ALARY into ALAR. I wonder why that wasn’t done? Those are small moans though, and an impressive debut from Nudd. Only the second puzzle that I have solved by this setter, I think, the other being in The Magpie. It’s good to see new setters making such good debuts. It’s also be good to be back blogging. It’s about time that Dave, Shirley et al had somebody to relieve them of the burden occasionally, so I think I’ll try to do more from now on. Right, time to fill out my submission grid, and time for those encores. Restless Natives, I think…. Another new setter this week, at least to Listener solvers (Nudd is known to Magpie readers and had an Enigmatic Variations puzzle last year). In Cross-reference, we had three clue types: double clues (two clues side by side), clues with a misprint of one letter, not necessarily in the definition, and normal clues. However, I reckoned they should be easily distinguishable. I didn’t like the way that the preamble said that the corrected misprint letters would be a hint to a prototype for each double clue’s grid entry, but that was only because I didn’t think I’d seen the word “prototype” in a preamble before! Perhaps it meant alternate letters from each word, but only time would tell. I felt that I should have got either 1ac or 4ac on my first pass through the across clues, but it was left to 9ac for that. As luck would have it, it was a double clue, leading to DECENTLY and SESAMOID (which I got by looking up til in Chambers). Unfortunately, my luck was short lived and I only got a half-dozen more across clues, with no more doubles. The down clues were a bit more productive, with 4dn DEODAR/CANAPE being the first. However, it resulted in a complete hash of letters in the fifth square of the second row … A/E/M/N. It was beginning to get a bit worrying! 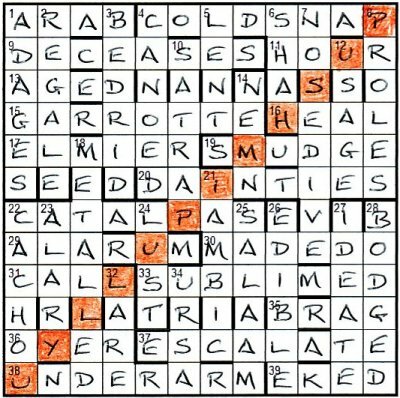 By the time I finished my first pass of the down clues, I had a couple of more doubles solved: SATEEN/PARROT and ELBOWS/EDITOR, but any idea that a selection of letters from each of these words could give the entry seemed quite remote. I vaguely thought that the title might refer to hybrid animals, like tigron and zebrinny, but nothing seemed obvious at this point, so it was just a question of ploughing on and seeing what happened. And believe me, the ploughing turned out to be quite hard work. The breakthrough for me came with 37ac ESCAPIST/ETALAGES where I finally realised that the first half of ESCAPIST could be entered as it was, since I had .SCA..T., and then ETAL reversed could give ESCALATE. An excellent puzzle from Nudd, which had me guessing all the way through, and another pretty difficult one in what seems to be turning out to be a difficult Listener year. ** Excuse the brief foray into politics! I’m not sure why, but my Listener solving day seems to be slipping. Perhaps it is because I plan to put my house on the market soon and I’m busy making sure everything is in good order for prospective buyers … or perhaps it’s because I’m playing too much golf! Whichever, I didn’t start The Tall’n’s latest until the second Sunday after publication. As I read the preamble, I was relieved that it didn’t seem too tortuous but I was worried that the seventeen jumbled answers and the vast quantity of highlighting and drawing required at the end might prove to be problematic. But at least we had been given jumbles of all the perimeter letters, which I thought a bit odd since we are normally only given the unchecked ones. After 7ac ECOFIN, I got 11ac ANCHORET with its clue number in cell 4. It was only at this point that I mused on the preamble wording about the jumbled entries “… starting in the numbered cell”. If an entry is jumbled, it is jumbled however you read it, so did this just mean that the first letter was entered in the numbered space and everything else was jumbled around it? Seemed odd, but that’s what I went with, and firmly entered an A in cell 4 and the rest lightly around it. Not that that helped much, cell 4 was unchecked. 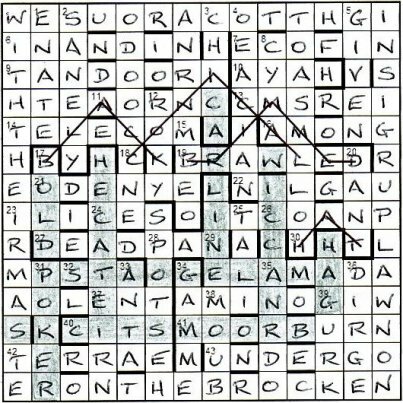 However, this was good news because it meant that the 17 jumbled entries could be identified as those having their clue number in other than the first cell … well 15 of them could be identified this way, two needed to have their first letter in the first cell, to be followed by the jumble. In theory this meant that all entries should be entered lightly, but I decided to brave the gauntlet and hope the two sneaky entries would make themselves known without too much trouble. I had sixteen clues solved in the first pass (about 30 minutes), including three definite jumbles. Over the next hour and a bit, I solved another 26. Good progress, except that exactly half of them were definite jumbles. By this time I had also identified the two sneakies: 13ac CRIMES and 4dn OCEANIA and I also found out how helpful it was to be given the jumbled letters for each of the four sides of the perimeter: it enabled some of the perimeter letters to be entered definitively. A bit convoluted, but with the unused letters I deduced WITH THEIR MASTER for the beginning, and it didn’t take long to see ON WALPURGIS NIGHT running up the right side. So the travellers were witches! Unfortunately, neither master nor Walpurgis had any meaningful entry in my ODQ, and anyway it hadn’t been mentioned in the preamble. I looked up Walpurgis night in Chambers and was amply rewarded: “… when witches … rode on broomsticks and male goats with their master the Devil, esp on the Brocken …”. This was getting interesting. I sussed that the top side would end with TO CAROUSE, and I could see a space for BROCKEN at the bottom. However, I had EHNOT to fit into .EN.HOT, and it took ten minutes of head-scratching before I looked up gam.. in Chambers to see that 34dn Whole range forgotten in note after school (5) wasn’t GAMUT but GAMME! So then it was time to find four travellers and their transport. Well, they had to be witches with their broomsticks and male goats. They were all pretty easy to find. The MALE GOATS and BROOMSTICKS were in reverse in rows 10 and 12 respectively. The four witches, HECATE, CARLINE, WICCAN and HAG, were to be seen running down columns 4, 8, 10 and 12 and the one they are going to meet, OLD POKER, in column 2. Finally, ten straight lines had to be drawn through 22 cells to show an “appropriately-shaped four-word description of what each of the four wears”. A bit of a hiccup here! I was probably looking for a hat or cape. I stumbled across BLACK in an inverted V shape, and almost next to it was a similarly shaped CONICAL. For some reason, I looked up witch, but that didn’t help. I read on through all the derivations and compounds, to be greeted by “witch’s hat n a tall black conical brimmed hat, the traditional wear of fairytale witches“, and there in a brimmed-shape hat was BRIMMED and a bit lower down HAT. It was only after I had done all the shading and drawing for my final submission that I realised that the apexes of these four words were directly above the four witches’ names. All in all, an exellent puzzle from The Tall’n with a huge amount of thematic material using information gleaned solely from Chambers. For those of us who download our weekly fix at 4 o’ clock on Friday (well, 5 o’ clock in these faraway places) the Tall’n’s Travellers came off the printer just as the royal wedding had its third replay. That clue at 24d (‘Girl with pet at home in this place’, CAT with HERE around IN) seemed like an ominous foretaste of what was to come, so we began to scour the grid for WILLIAM, ARTHUR or LOUIS and to wonder whether the other travellers included the delightful little scowly bridesmaid. It was not to be! The numpties forged ahead and had our twenty ‘now we’re OK’ clues in place in little over an hour. In fact we had all those lovely transparent clues solved (‘Subdue old poet without drug’ DANT(E), ‘Features not betraying emotion passed on by a god’ DEADPAN, ‘European firm with hand in legislative council’ ECOFIN) and even one or two of the more obvious jumbles. The placing of the clue numbers identified 15 of the 17 jumbles and 4d (‘in the main Australia welcomes independent countries nearby’ OCEANIA), and 13ac (‘Court of Session, accepting dated verse, convicts’ CRIMES) soon proposed themselves as likely candidates for the remaining two places. Weren’t we doing well! And then the struggle began. Hands up if you hate jumbles! Ah, I see that I am in a comfortable majority. It was midnight before we had untangled those jumbly clues and we were whining (MIAOWING ‘Whining back, to direct a remark due’) when we couldn’t find that definition in the BRB and were wondering what obscure word fitted our ?NA? ?D?N pattern (‘With constant repeated interaction senseless noise replaces energy’) Another sly comment on the royal wedding? The trouble was that we still had to work out the perimeter. ‘Twas now the very witching time of night and most of the street party carousing was probably slowing down but we remembered the date. That ‘today’ in the preamble finally made sense. The last day of April? Walpurgis Night! Now we understood why Brocken seemed to be the only choice along the bottom of the grid. Our four travellers were going ‘To carouse with their masters on the Brocken on Walpurgis Night’. The BROOMSTICKS appeared next. Such a clever compiler’s touch, isn’t it, to put a key word in backwards? Once we knew that we were looking for witches or wizards, HECATE and WICCAN were easy to spot and we slowly teased out CARLINE and decided that HAG had to be the last one, as we had only three letters left. (Of course, Chambers confirms that a hag was, originally, a witch). No numpty red herrings? You must be joking. We know that the devil was believed to disguise himself as an old goat, and assumed that he was the one the hags were going to meet even if his position in the grid was not ideal (they were sitting on him!). Of course, the light of Walpurgis day produced OLD POKER and we were able to consign a couple of the witches to the MALE GOATS as riders. All that was left to do was to find some sort of witch garment. It had to be the hats and CONICAL, BLACK and HAT appeared. Only the BRIMMED one escaped us leaving us with an odd permutation – one word, seven letters and four lines. We did find it, after a lot of head-scratching and were so astounded at all the material that The Tall’n managed to include that I decided to get out the coloured pencils and add a bit more. What an astonishing wealth of compiling. Many thanks to The Tall’n. Is it St George’s day today? Is it Shakespeare’s birthday? Are the numpties just a little bit slow on the uptake? This must be the first time that we have ever gazed at a grid (not another carte blanche! ), the preamble and the clues for two hours without putting anything at all on paper. I think the Times must be saving ink as we keep getting these grids without a single bar! Out of EVOHE, we teased the notion that we had to remove one letter from the definition to produce our wordplay, and that that letter could be established by using the position of the extra word; in this case, the E appeared last in the fifth word, HYTHE. Thus we had to enter EVOH (though in numpty fashion, we turned it ‘aback’ and entered HOVE – just to lead ourselves up the garden path). We struggled! I would say that each clue took us just about as long as a complete FT solve (and we are slow, even with the Financial Times!) However, as we wormed solutions out of those fearsome clues, we became more and more amazed at Poat’s ingenuity – this was brilliant compiling! Our next problem was that for a while, we found only solutions that were real words, INBY, TEPID, OVER and GEAR, yet, clearly this couldn’t be the case for LYASE (‘Dissolvent enzyme changing ends in Yale’) The fifth letter, E, had to go, as was indicated by the fifth word in the clue, ENDS, but changing ‘Yale’ and producing LYAE gave us an odd non-word. Our task was more difficult than we had initially thought. We struggled our way to (H)ORROR FILM and BREAS(T)DEEP – a bit of vulgarity there in that reversed slash (result of all that oenophilia?) – and daylight finally dawned, well, actually we were well into Saturday when we managed to work out that, yet again, our first entry didn’t begin in the first square of the grid. Putting FETC(H)ER in the 1 Down position (OK, I know numbers and bars are not to be added!) gave us the skeleton of a grid fill. Fortunately, filling that in gave us the help we needed with those final clues in the south-east corner, ‘A nudist painter, Swiss, shaved lower leg’ Hmmm, a bit vulgar again, Poat! It had to be Klee (just about the only other Swiss painter who springs to mind after Hodler) and the lower leg must be the ANKLE, so we remove the second letter (the N provided by ‘nudist’) and shave a bit off Klee and there we are. A full grid. And a post-script – was I alone in wondering why ‘aback’ appeared in that EVOHE clue? It took a nudge from a friend to send me back to the clues and to get me to read them aloud – what a wonderful extra touch. I spent one entire university year studying nothing but Hamlet and should have spotted the iambic pentameter at once. Superb, Poat! 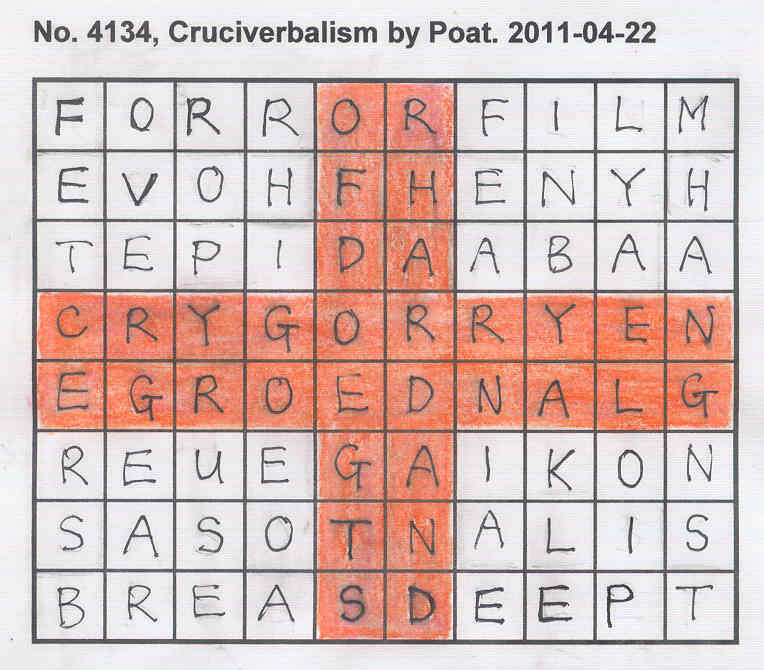 I repeat myself – this must be the most difficult Listener crossword for some time. However, that doesn’t detract at all from out immense admiration for a spectacular work of compiling. Amazing, Poat, thank you.